The Hills Are Alive…with The Sight of Music! Feeling a bit musical this March (most definitely influenced by binge-watching Amazon's Mozart in the Jungle), this month’s post highlights the cross-cultural disciplines of music and art. While we covered dance a little while back and even paired certain artworks with a curated soundtrack, the depiction of music within art reflects the multiplicity of passions throughout various art forms. Whether depicting one belting out lyrics mid-song, pairs engaging in the collaborative recital of a concerto or perhaps persuasively trying to get out of practice, the art of music, demonstrates the luxury of leisure. 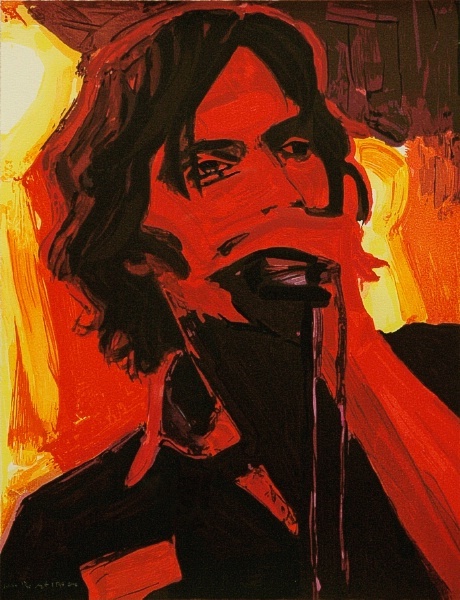 Elizabeth Peyton, Julian, 2006, Ukiyo-e woodcut, Leslie Sacks Gallery. Click to inquire. 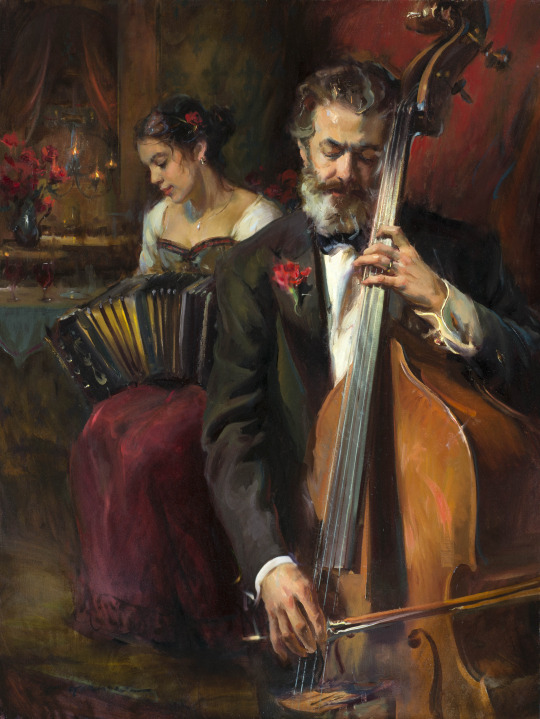 Daniel F. Gerhartz, Inheritance, Oil on linen, Eckert & Ross Fine Art. Click to inquire. 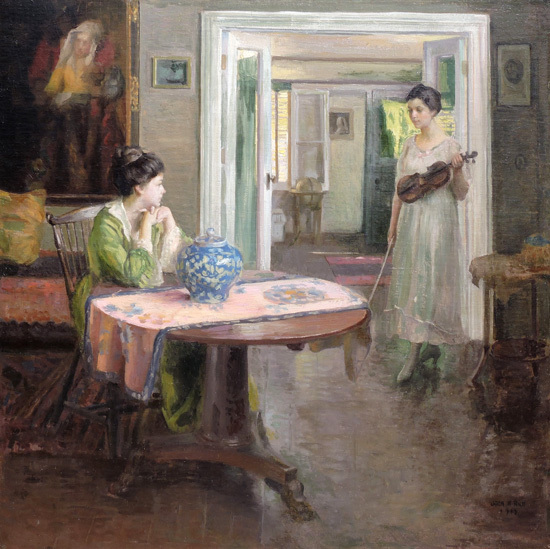 John Hubbard Rich, The Violin Lesson, Oil on canvas, George Stern Fine Arts. Click to inquire. One thinks of Gilded Age portraits, its nineteenth-century subjects enjoying music as a visual indicator of their status: reflective of their worldly, cultural self. 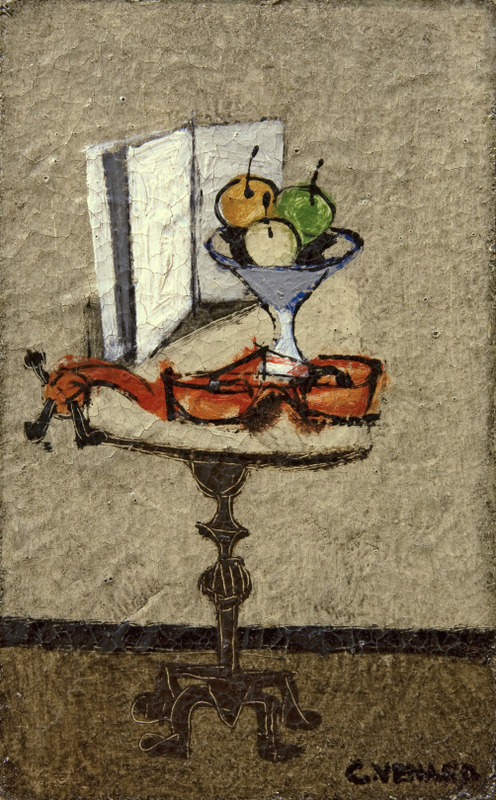 Additionally, the musical additions featured in “Nature morte au trombone” by Claude Vénard from Guarisco Gallery is a modern take on the still-life, where old Dutch Masters’ depictions of musical instruments with broken cords was a memento mori, reflective of the temporality of life. 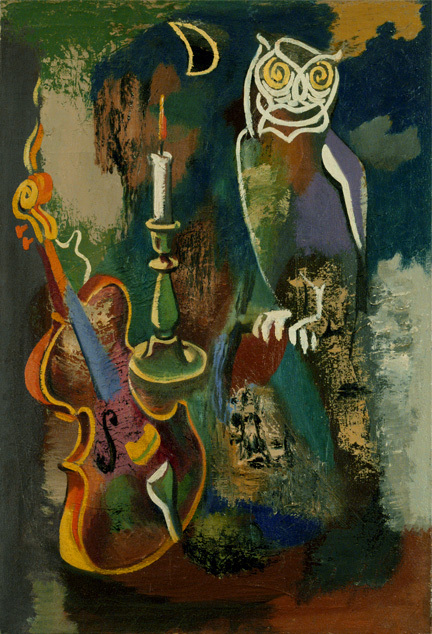 Claude Vénard, Nature morte au violon (Still-life with Violin), ca. 1940, Oil on masonite, Guarisco Gallery. Click to inquire. 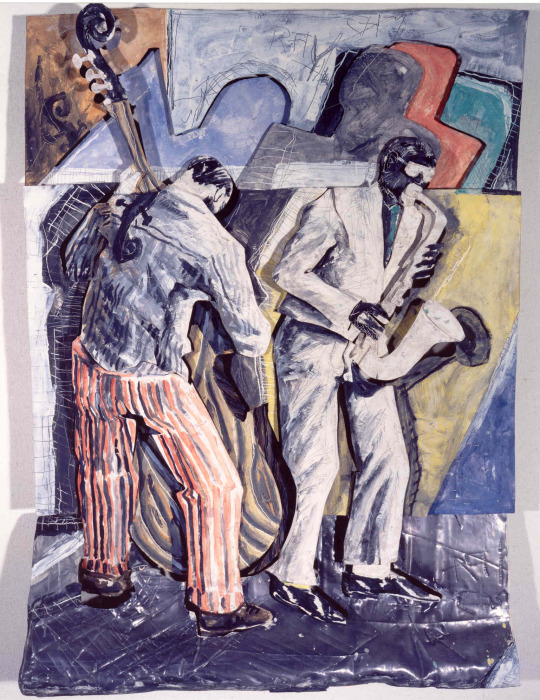 Artworks with themes of song and sound, cannot firstly, capture their auditory qualities; however, its visual representation becomes an identifier, a glance into the subject. Even more so, while you can't hear the saxophone in Nothing Gets Past Mrs. Hussey, the funkiness of its visual composition will always vibrate through. 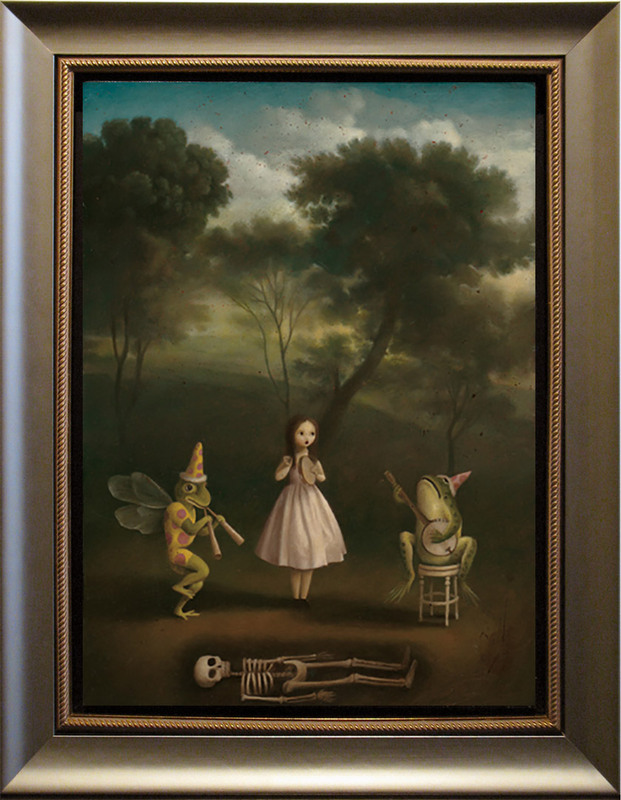 Andres Nagel, Nothing Gets Past Mrs. Hussey, Mixed media and oil on polyester and fiberglass. Tasende Gallery. Click to inquire.